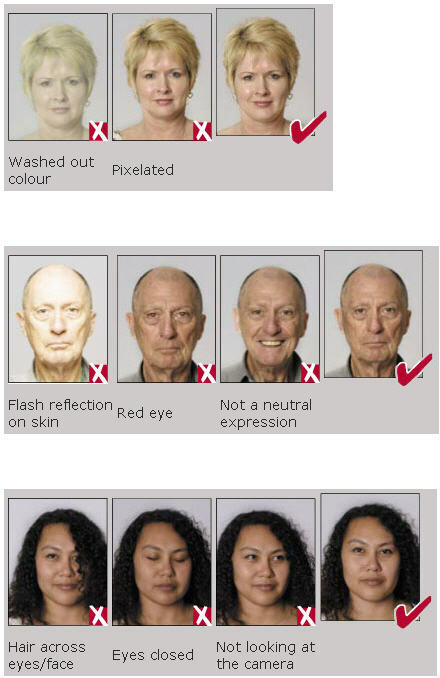 Australian consulates are very picky when it comes to accepting passport photos. Many of our customers had prior rejections from those consulates but we were able to help them with passport photos that met requirements. "These guys are awesome. I hold dual citizenship with the USA and Australia. 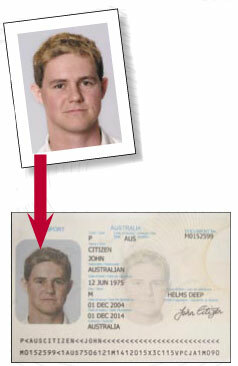 When it came time to renew my Australian passport this past month, I had the most horrendous time with the Australian Embassy accepting photos. After a second rejection, I did a search and found these guys. A friend took my picture and I sent them off and voila! I was provided with three sets of photos all at different millimeter heights and I sent them all off (figured one had to work) and I just received my renewed passport yesterday. Thank you so much and I would recommend you all to anybody who is having difficulties getting their passport photos accepted by the Australian Embassy in the USA. Wish I had found you when I first started the process." To make sure everything goes smoothly, its important that when taking your photo you follow the requirements on their website (we've also transcribed them below). You must use a uniform background to provide a contrast to the face and hair. Preferred background colour 18 percent grey Other recommended background colours are light blue, cream, beige, pale grey, white. Take your photo in aprox 8MP or more. Optical focal length lens (or variable lens locked into position) between 90 to 130mm (35mm film camera equivalent). In short, use 3x to 4x zoom in your camera. the image must be taken using "shadow less lighting". Background slave flash can be used to remove shadows. The lighting should not give the subject "red eyes"
I will definitely using you again and recommending you to all my friends. Comments : I just wanted to say thanks for a great service. I looked all around Vegas for a photographer who would even consider attempting to take a passport photo to Australian standards, but most either didn't get it at all or simply refused to do anything other than US specifications. The Australian embassy had no problems with your photos and I have my new passport. I wish I'd checked you guys out earlier and saved myself a lot of fuss! 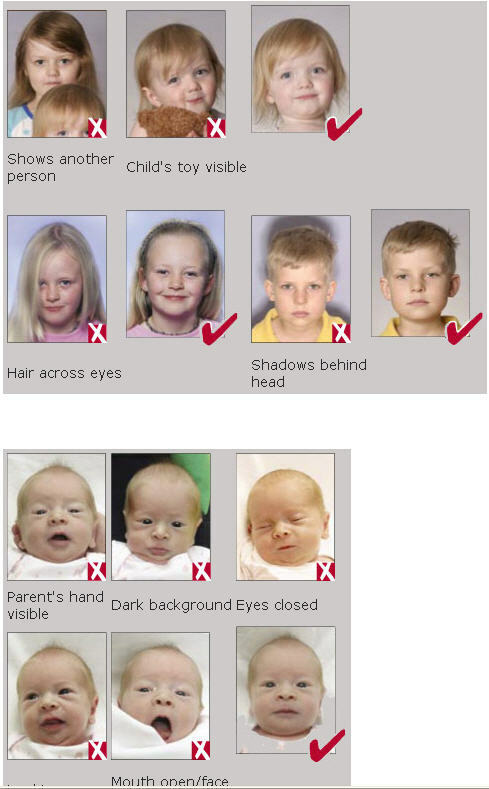 When lodging a passport application for Australia, you must provide two recent identical color photos of yourself with your completed application form. For a new application, one of these photos must be endorsed on the back with the words "This is a true photo of (your full name)" and then signed by your guarantor. For a renewal application, which is the one page form, one of your photos must have your name printed on the back. The photos must be no more than six months old. 45–50mm (1 3/4" -1 15/16" ) high and 35–40mm (1 3/8" -1 9/16" ) wide show head and top of shoulders close up, so the measurement of the face from the bottom of the chin to the crown (i.e. top of head without hair) is between 32mm and 36mm (1 1/4" -1 7/16" ). Tip: Click here to download a pdf which you can use to validate your photos. Please download and print it. Put your finished photos on it and make sure your photos have correct head size. Please take a very important note that they look at crown which is top of head without hair. You need to assume a person as bald and guess where would the top of head with no hair. 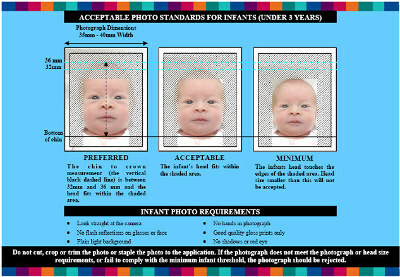 Click here to download Australia Passport Photo template. photograph cannot be manipulated, for example, by removing spots or softening lines. 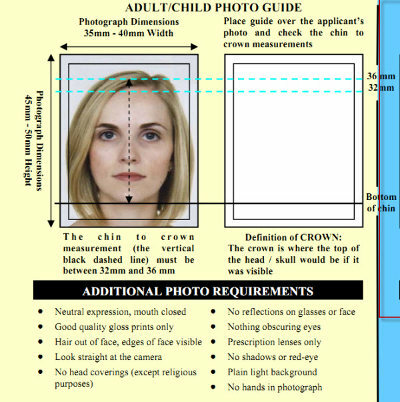 On Australian Passport Pictures- Head coverings are not permitted except for religious reasons: in which case, facial features from bottom of chin to top of forehead and both edges of your face must be clearly shown. lighter framed glasses are preferable if you have them. List and Contact information for various Australian Embassies, high commissions, consulates, multilateral missions and representative offices across the globe.